I thought I had worked with the 'pink bride' until I met Olivia. She is all things pink, and more. Flowers are her everything (if you don't count her husband, her writing and her dogs, those are way up there too!) Lucky for us, she agreed to write her own blog - no arm twisting involved - so without further adieu meet our pinkest bride yet, Olivia. If you’re reading this that means one of two things are true. 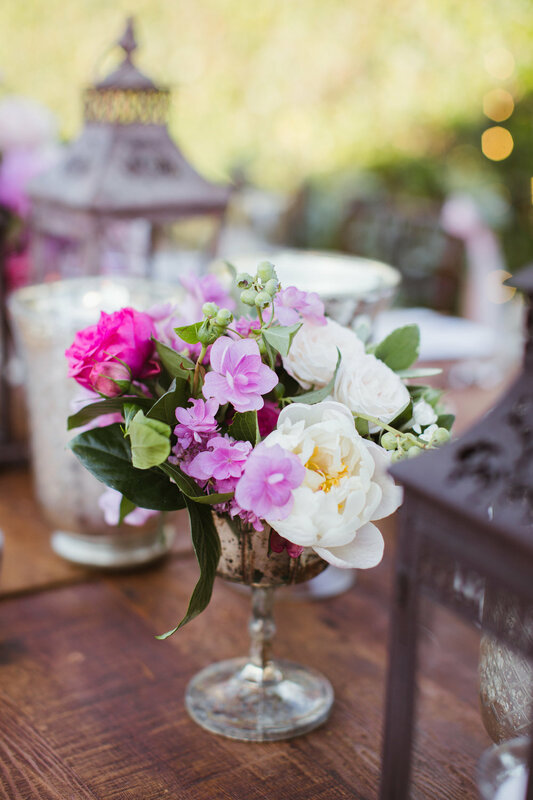 You are in once-in-a-lifetime kind of love and have the true privilege of planning your wedding, or you are just a total, fully committed lover of all things floral. Either way, you’ve come to the right place. I’m a flower obsessed newlywed who frankly still hasn’t and hopes to never come down from the cloud nine feeling that comes from living out your fairy tale dream day – during which you partied with your favorite people, had a show stopper bouquet that weighed more than toddler, were surrounding by candles, twinkling lights and flowers galore, ate churros and married the love of your life. Fairy tale. I know. A little clichéd of a term when it comes to weddings or events in general and yet here I am, one hundred and thirty-one days into marriage and still failing to find a better word for June 17th, 2017. I can come up with a lot of words to describe it – warm, gorgeous, glowing, blissful, jaw-dropping, butterfly-giving, soul warming, bursting with happiness – but really, fairy tale seems to sum all that up in a neat, perfectly pink package. Speaking of pink. I should address this now. I fiercely love pink. Not just pink. All pink. Every single shade of pink – from the hottest of hot to the creamiest of blushes and everything in between. I’ve loved pink long before it was cool to love pink – wait, it’s cool to like pink, right? For me, pink is happiness. It’s warm, it’s bright, it’s cool, it’s loud, it’s the happiest color, and it’s so utterly pink. So it came as no surprise to anyone when we sat down to plan our wedding that the first two words out of my mouth were pink, and flowers. Cake probably, realistically, wasn’t too far behind because let’s be honest, who doesn’t love cake? Cake aside, I’ve been dreaming of my wedding flowers since I was a little girl. No, you read that right. I said flowers. I wasn’t the type of little girl who finds herself filling journal pages with sketches of her dream dress or losing herself in visions of intricate, Princess Kate type veils. I didn’t spend my pre-engagement days lusting over a bride’s wedding band or perfect wedding hairstyle. 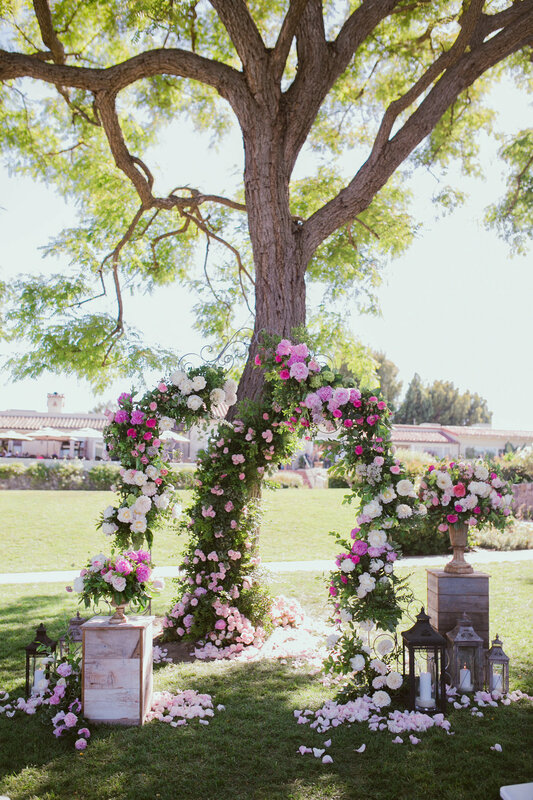 I noticed the flowers, the arches, the bouquets, the floral crowns, the stems, the blooms. My caffeine fueled Pinterest boards will attest to this – every vision I had for my wedding began and ended with the flower arrangements. Because the only thing that comes close to my love of pink is my ridiculous over the top love of flowers. I love flowers so much I found a wedding dress that had hand-made petals all over the skirt. No, seriously. To me, flowers are the ultimate embodiment of everything beautiful in our world. They’re magic. They sprout from the ground and bloom into bunches of color and grace that can encapsulate every human emotion. You’re sad? I’m sending you flowers. You’re over-the-moon happy? You’re getting flowers, girl. You’re new to the area, you’re mourning a loss, you’re madly in love, you’re celebrating, you’re brightening up a room – you’re getting flowers. Clearly, my wedding flowers had to bring it. I mean, really bring it. And oh boy, did they ever. In comes Annette Gomez. Flower Queen extraordinaire, master of the magical blooms, tamer of all that grows wild and unruly. Or, you can call her what I now affectionately call her – my flower fairy god mother. 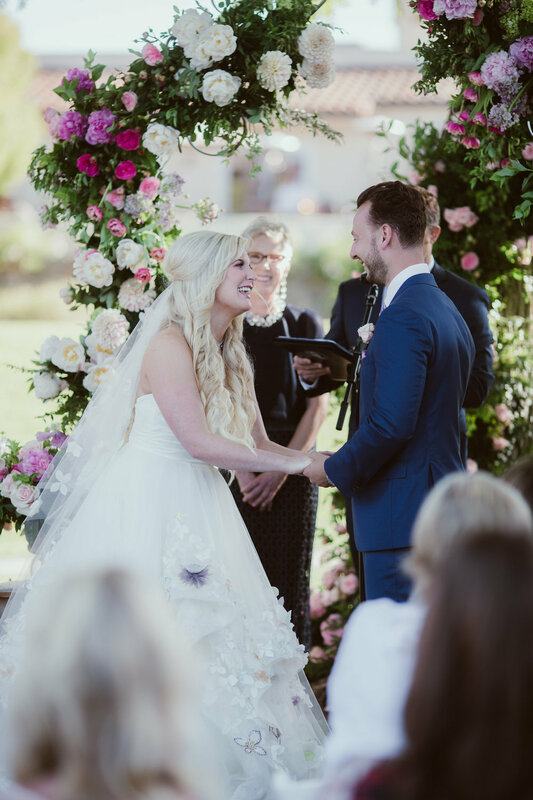 Annette was able to hear my obsession with big, bold, wildly fun flowers and my passion for pink to create the most jaw-dropping, heart-bursting, fairy tale worthy flowers for the day we said ‘I Do’. So much so that I burst into tears the moment I saw my bouquet, then again when I started that blissful walk down the aisle to see the most spectacular floral arrangements and arch. Oh yeah, and my future husband! He was there too, woohoo! But those flowers. Those flowers. 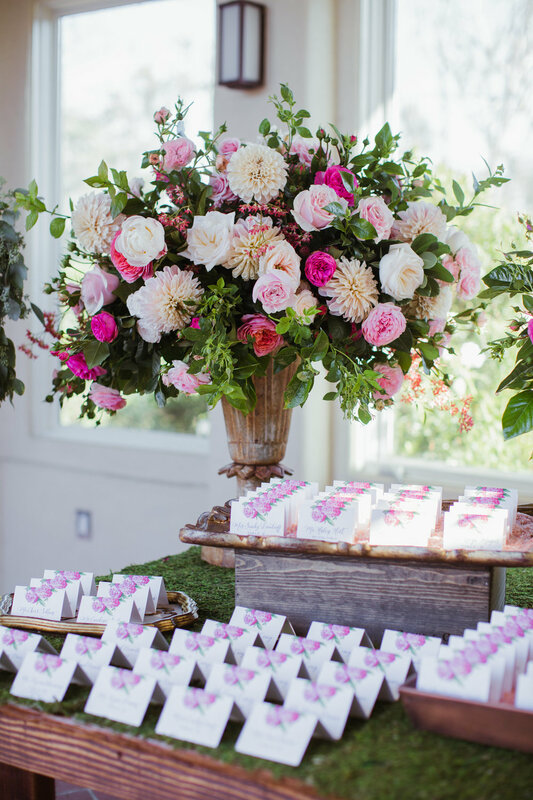 Everywhere I looked was a burst of blooms – peonies and ivy, mint and roses, big, over the top, swoon-worthy flowers nestled amongst delicate petals...to say that it was breathtaking would be a true understatement. 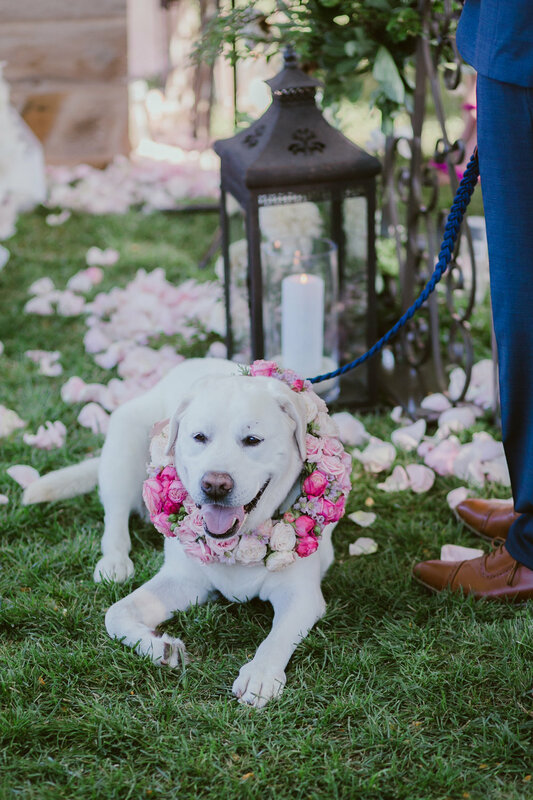 Our sweet Labrador even had the most gorgeous wreath of peonies around his neck. Every single detail was exquisite and more than I could have possibly known to hope for. Annette has a true gift and her ability to share that with us forever made our wedding the most stunning day. I’ve been a wife to the love of my life for one hundred and thirty-one beautiful days now, and one hundred and thirty-one days later friends and family are still gushing over our big day. It was absolutely everything I could have ever dreamed it could be, and then some. I’m ninety percent sure that day made my heart the happiest it has ever been. One hundred and thirty-one days later, and I am still totally head-over-heels into my husband too, which is a good sign. Oh! And guess what? He’s still bringing me flowers. Pink ones. Mar 5, 2016 We Have a New Logo!! !